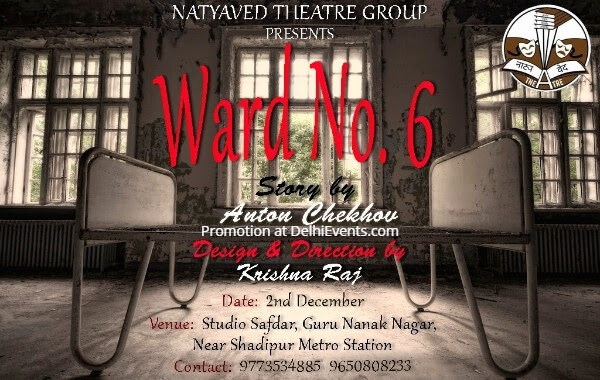 Event Description : THEATRE : Natyaved Theatre Group presents "Ward No. 6" Hindi Play. The story is set in a provincial mental asylum and explores the philosophical conflict between Sadanand a patient, and Dr. Sharma the head of the mental hospital . Sadanand denounces the injustice he sees everywhere, while Dr. Sharma insists on ignoring injustice and other evils; partially as a result of this way of thinking, he neglects to remedy the shoddy conditions of the mental ward. Eventually Dr. Sharma's mental health deteriorates. He himself becomes a patient of the hospital and dies soon thereafter.